If you constantly yearn for the simpler days when home based console games were in their infancy then we have some great news for you. JAKKS Pacific has launching a simple plug-in-and-play gaming system which features 10 of the most popular videogames from the old Atari gaming console. The authentic, lightweight and compact controller is modelled on the original Atari 2600 joystick and gives first time and experienced gamers a true taste of the primitive but exciting game play that at the time was thought oh so advanced. 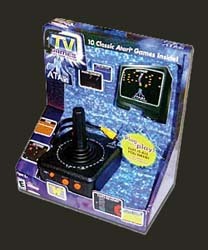 The 10 vintage games - Asteroids, Adventure, Missile Command, Centipede, Gravitar, Yar's Revenge, Breakout, Pong, Circus Atari and Real Sports Volleyball - are all presented with retro graphics and sound and come ready loaded into the joystick controller, making this 21st century Atari the perfect portable, affordable and easy to use gadget and gaming device. Here, at sci-fi-online Towers, we have been mostly playing Centipede. Let me tell you this has caused a few fights and bruised egos. Mr Rea, our esteemed editor, has so far managed to rack up the highest score - of course we let him win as we want to remain in gainful employment. The majority of these games will probably be played once, or twice and then never touched again. In fact we had an 11 year old in the office who managed to complete Adventure in 30 mins. Great fun when you have a few friends round - shame you can't play head-to-head though. Probably the present to buy for that 30-something who has everything.